Cable Ties & Wiring Components | Zip Ties | Screw Mounts | Cal Fasteners, Inc.
Keeping cables and wiring neatly organized can make a huge difference in your workplace. Tripping hazards can be eliminated, and simply being able to keep track of what goes where can make installing or removing equipment a far faster and easier process. 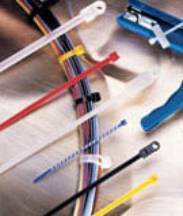 To that end, Cal Fasteners offers a wide range of cable ties, wiring components, and related products. Our inventory includes numerous cable tie and zip tie varieties, various mounts, labels, straps, wraps, and more. All are manufactured from high quality materials for long working lives. See individual product listings for additional information. If you’re not sure which product is right for your specific needs, or if you can’t find the exact product you’re looking for, feel free to contact us. Our team will be glad to help you find the product(s) you need. We pride ourselves on providing unparalleled customer service before, during, and after every order. Top quality products and highly competitive prices make Cal Fasteners your number one source for cable ties, wiring components, and more. Request a quote on the products you need, or contact us to learn more.